During today's stage 8 of the Giro d'Italia, a Spanish racing cyclist by the name of Pedro Horrilo lost control of his bike on the descent of the Culmine di San Pietro (Summit of St. Peter). The poor man went off the road and feel straight into a ravine. Doctors report he is in an induced coma and on a respirator, with multiple fractured ribs, fractured leg, a broken kneecap, a perforated lung and head trauma. The descent of the Culmine is a very technical one. 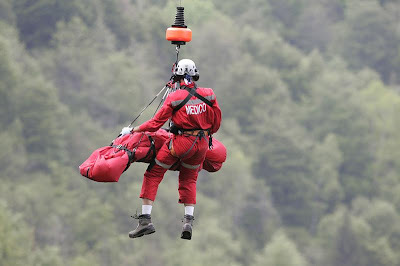 According to paramedics, he fell more than 60 metres down the ravine before being airlifted by helicopter to a nearby hospital in Bergamo. The summit of St. Peter is a pass at 1258 m altitude in the municipality of Cassina Valsassina. 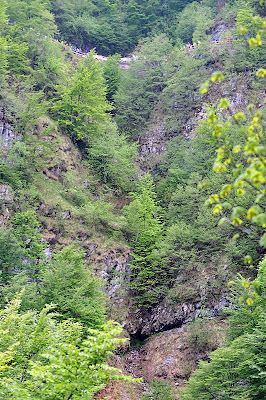 In the past this crossing was used by shepherds in the Val Taleggio to conduct trade relations. To see an example of what this rider may have faced, here's a video from another race last year. 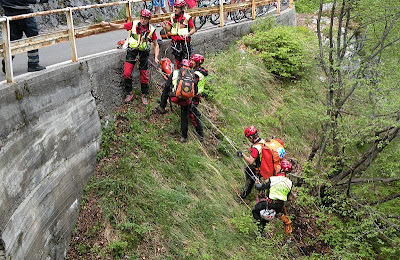 I'm not terribly thrilled to know that mega bike races such as the Giro, for entertainment purposes or otherwise, have to design courses in such a way that riders face such life threatening situations. Pedro is 6ft tall, and sitting on a big bike like that high above the ground, the railings by the side of the road are too short to offer any protection. This is almost like going to war. There is no guarantee that you'll get back in one piece to your family. So what is the limit for race organizers? When does it get a little bit too much to bear? Feel free to discuss. Note : All Photos Courtesy Of Roberto Bettini. This isn't the first. The Giro has been plagued with crashes since stage 1. Its very sad for the riders. The railings are short, but what did you expect? These roads are probably old as the giro, who knows. The rust on the railing tell. Surely you can't build a great wall of China there. Its not all over the place. The Culmine was the only long descent of the day. This year's Giro is very unorthodox. Too many climbs, too early. They're doing this to make the race standout. All at the expense of riders. Why does this remind me of P.T Barnum? This was the rider's fault. Its obvious he didn't slow his bike down enough before hitting the guardrail. I think I see the point on the question what is the limit. If they wanted , they could even have the riders go through a road in the jungle full of wild animals, or make a course that is all descent. Hey maybe you could write about optimal course design! It is dreadful. The chasm between the actual experience and sitting at home watching is enormous and makes understanding and judgement difficult. Hopefully the race organisers will learn from this. I think there were some safety 'nets' placed along the course today - but why not there? As always it's a question of probability: was the accident unlikely to the point that the organisers where right to not make the turn safer, (was it so unlikely that the accident was even more tragic) - or was it too probable. It looks to me, given the fall on the other side, that there should have been a safety net/fence put there. I hope he recovers. Peter : I guess what I'm trying to get to is having short, dangerous or defective guard rails is as good as having no guard rails at all. Is it too much cost-wise for them to have a better make-shift barrier along the sides of sharp corners so riders don't go over the rails? Well I agree with most people. This is a terrible accident. Should have never happened if they had better safety. Tom, Bike Boy : I'm not a traffic engineer, but look at the guard rail in the picture. It looks solid, old and rusted. I think a better alternative would be to replace that with a low tension cable system that gives on impact, you know..and cushions you from toppling overboard. This way (and if you make it high enough), even if a rider hits it due to an accident, he wouldn't break a bone or get smashed in the groin. Or fall off the road from great heights. You have to consider a better guardrail design for that section of the road. Look at the drop down to the ravine! 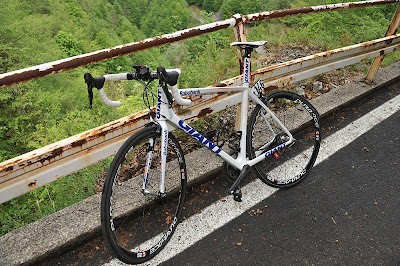 Note, even Lance tweeted about unsafe courses in this year's Giro. It wouldn't have been so bad if they made them ride uphill on that road. Downhill is too dangerous. Oh well, either way what comes up has to come down..
Thankfully he has no brain injury. Thanks to his helmet. This brings memories of Fabio Casertelli. Its horrible that even after his death, races aren't made any more safer. I would be disappointed to see the great Giro coarse "dumbed down". I don't like to see riders injured but they have a responsibility to ride to the conditions. My opinion is pull out of the event or don't enter if you think you will not be able to ride the coarse with due care. The best way to make cycling safe is put everyone on stationary bicycles. Next make the racers wear fall arrest harnesses so they can't fall off there stationary bicycles. Then use a computer to simulate a race. So, the giro puts up fancy crash protection for the one day the race goes through, and what happens for the rest of the time? These are not private roads, so normal cyclists & pros out training use them everyday. They may not be racing, but the roads aren't closed & being downhill anybody can go as fast if they don't use their brakes. Lance has just come back from a broken collar bone, so is rather sensitive at the moment. If pros were that concerned about safety, they would tighten their helmet straps properly, so they would actually provide some protection in an accident! Pardon me if I differ from fanatical views, but Lance has been a whiner all this year. From ordering helicopters away on a whim, to sensationalizing his dispute with the French. He needs to man up and be what he was a few years ago. Sorry, but I just can't see him winning any more with this attitude. Live with it, this is bike racing. Race organisers like climatic endings, and twisty dramas. What do you do? Its a money business afterall. On a 3 mile descent, 10% average, last weekend I went real slow... 15 mph or so; pretty rough road. Front rim got extremely hot, melted my rim strip, and my tube expanded into a spoke hole and punctured. Some sort of yellow non-cloth plastic rim strip that came with my Alexrims 450.